It’s not every day a first-generation college student from Stanislaus State finds herself working on Capitol Hill while the nation is swept up in the whirl of a pivotal historic event. But that’s exactly where political science major Itzayana Rodriguez was last fall as Supreme Court Justice Brett Kavanaugh’s confirmation process came to a dramatic conclusion. “That final week of September was very tense. There were a lot of protests and so much happened in the span of just one week,” said Rodriguez, who worked in Rep. Jim Costa’s office for three months as Stan State’s 2018 Panetta Institute for Public Policy Congressional intern. The program is one of several undergraduate internship programs administered by the University’s political science department. From the start of the work week, the phones rang constantly and the office was buzzing with activity. Rodriguez and another intern were assigned to answer the phones and talk to constituents who called in to express their opinions and ask questions. It was the type of work she expected as a participant in the program founded by former Secretary of State Leon Panetta to expose students to policy issues and the mechanics of government at the highest level. Something Rodriguez didn’t expect happened near the end of that frenzied work week, when Christine Blasey Ford, a college professor from Palo Alto, appeared before the Senate Judiciary Committee to testify that Kavanaugh assaulted her in the early 1980s. Rodriguez was surprised to find herself watching the day’s testimony on two large screens set up in a committee room not far from the room where the testimony was taking place. She was joined in the room by other interns and some supporters of Blasey-Ford. “There were about 100 people in the viewing room, yet it was silent, except for the occasional gasps or claps of approval,” she recalled. A large group of protesters had formed at the Supreme Court, and Rodriguez watched as they stormed the steps. One woman started pounding on the main doors, demanding accountability, then other women in the group followed her lead. Many of them wore black veils and tape across their mouths to symbolize their belief that their voices had been ignored. “I still get chills thinking about that moment because it was so impactful,” she said. The following week, she attended oral arguments at the Supreme Court and saw Kavanaugh in his new position. “He was already sitting on the bench. I definitely saw it all play out,” she reflected. While that week was the most exciting of her internship, it is not the first thing she mentions when asked what she found most interesting. Instead, she talks about attending briefings and researching issues that directly touch the everyday lives of average people, such as criminal justice reform, food insecurity and the lack of affordable, fresh food in rural areas often served only by convenience stores, not grocery stores. On track to graduate in May and planning to attend law school to become a civil rights lawyer, Rodriguez took the greatest interest in criminal justice reform. As she studied the issues, she was surprised by their complexity and gained a better understanding of the varied opinions on the topic. She learned about water issues and often took calls from Costa’s constituents on the topics of increasing water storage and ensuring a more reliable supply of water for the Valley. She also gave constituents hour-long tours of the Capitol, culminating with a walk through the Rotunda, which she said was usually the highlight for visitors. 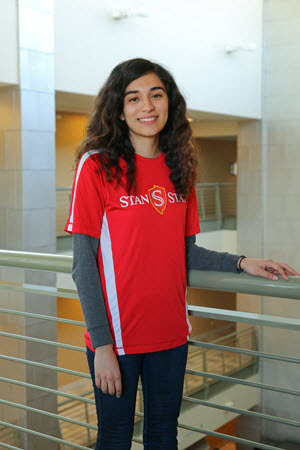 Rodriguez reflects on her internship as “an incredible experience” and finds it hard to believe that it started with a simple application form distributed by one of her political science professors. It’s the type of experience she believes would be valuable for anyone, not just political science majors, because everyone is touched by government.